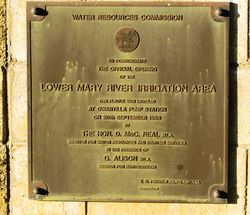 A monument commemorates the opening of the Lower Mary River Irrigation Area in September 1988. 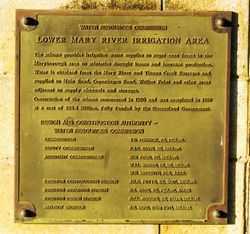 This plaque was unveiled at Owanyilla Pump Station on 20th September 1988 by the Hon. D. McC. Neal M.L.A. This scheme provides irrigation water supplies to sugar cane farms in the Maryborough area to minimise drought losses and increase production. 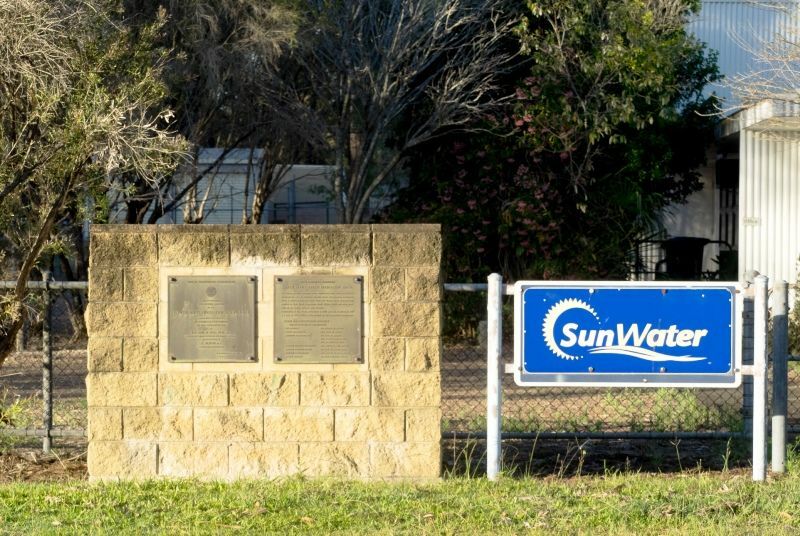 Water is obtained from the Mary River and Tinana Creek Barrages and supplied to Main Road, Copenhagen Bend, Walker Point and other areas adjacent to supply channels and storages. Constuction of the scheme commenced in 1980 and was completed in 1988 at a cost of $25.4 million, fully funded by the Queensland Government. Commissioner T. D. Fenwick, BE, FIEAust. Deputy Commissioner P. J. C. Bevin, BE, MIEAust. Assistant Commissioners M. M. Pegg, BE, MIEAust. W. A. L. Webber, BE, ME, MIEAust. W. N. Meredith, FCS, AASA. Director Construction Division J. K. C. Potts, BE, DQIT, MIEAust. Director Irrigation Division H. S. Ross, BE, FIEAust, AFAIM. Director Design Division R. C. L. Rogers, BE, BEcon, MIEAust. Project Engineer R. G. Head, BEng (QIT), MIEAust.